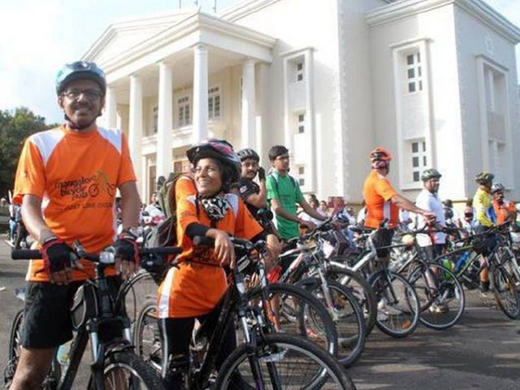 Mangaluru, Dec 09 2017: Our coastal coastal city, Mangaluru, will hit the road to pedal with gusto when the 11th edition of annual cycle rally organized by a fitness club and media house is held on Sunday, Dec 10. For the third consecutive year the cycle rally is promoting the theme - Save Water, Save Life to inculcate the need for water conservation as a regular movement among masses and also instill the basic principles of road safety among the people in general and youngsters and youth in particular. With registrations for the event formally closing, the organisers have received more than 3000 entries, most of them children above 10 years. Giridhar Kamath, chief convener of the rally said the event has an objective of fun, frolic and should lead to a healthy lifestyle among stakeholders. It also encourages the team and group participation the most for the participants have to maneuver through the nearly 22-km route while understanding it is not a race, he said. The response to the event has been encouraging with numbers increasing with each passing year, he said adding the organisers have put in place all arrangements including first aid and ambulance service, mobile cycle repair vans to deal with running repairs the cyclists may need. Water and snack points have been set up at vantage points to give cyclists break, opportunity to regroup and move onwards under the watchful eyes of rally stewards and city police authorities. This is also a platform where people of all sections to gather under one roof aiming to reach a common goal. It is also an event that demonstrates social responsibility and is an opportunity to highlight unity in diversity. The flag off ceremony will be held at Lady Hill Circle at 6.30am and end at Boloor, a distance of 22-kms via Ladyhill-Tannirbhavi-Malemar-Boloor. Attractive prizes are also being planned for this mega event. Prizes will be distributed at the end of the event.